Royal enfield motorcycles were known for their easy DIY maintainance techniques but with the introduction of modern unit construction engine and changing time, more and more bulleteers are heading for paid services for small repairs and maintenance of their Royal Enfield motorcycles. But everything is going to change with the introduction of Do-It-Yourself customer training program by royal enfield. On the 25th of February, 2012, Royal Enfield will conduct th Do-It-Yourself customer training program at its Old Madras Road Service Training Institute, Chennai. Through this workshop, Royal Enfield will train customers to carry out regular maintenance and small repairs that they might encounter in the middle of the road or elsewhere, especially while on long tours. The best part about this programme is that Royal Enfield is organizing this workshop absolutely free of cost for all existing Royal Enfield customers. Interested participants will have to make their own arrangements for travel to Chennai and accommodation for the 1 day workshop. How can you participate in this workshop? 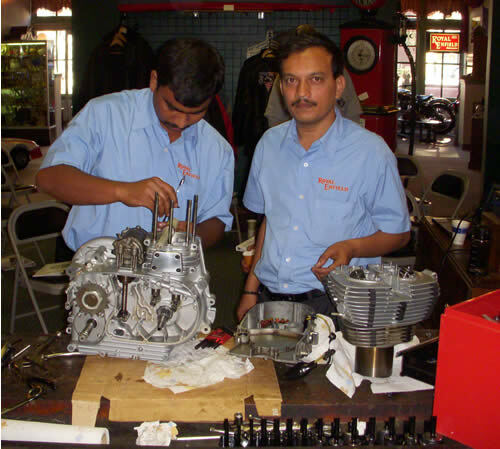 You need to get in touch with workshop supervisor or manager of your nearest Royal Enfield dealership or Brand Store. Royal Enfield will also have a registration form on their website. So, you could watch out for that. Also, you could send an email to facebook (at)royalenfied(dot)com . Meanwhile, the entry to this workshop will be on a first-come-first- serve basis as a limited number of places exist. Once Royal Enfield receives your registration details, the factory will send a confirmation to each of the participants via email, sms or a telephone call. Royal Enfield will provide lunch on the house during the workshop. What do I do if I cannot attend this workshop? worry not, Royal Enfield is planning to conduct six more workshops this year in each alternate month. So, you could register for the next edition of the customer training DIY workshop.